The graduation ceremony for people who graduate this semester was held on February 1st, 2019. Although official graduation ceremony was scheduled to be February, 2019, we held our own ceremony earlier due to other team members’ schedule. 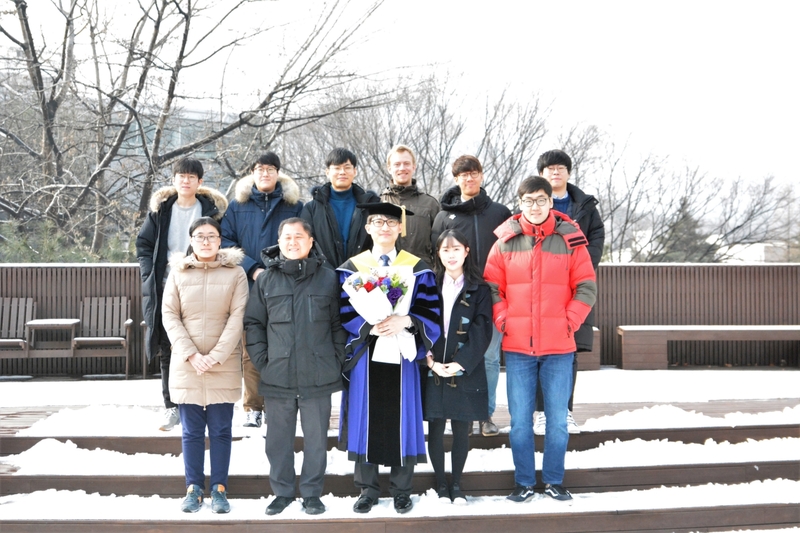 Our team members, Dohyun Kim and Doheon Kim received Ph.D degree. Former members of HYKE visited SNU. Prof. Qinghua Xiao, Prof. Xiongtao Zhang and Dr. Dongnam Ko visited for new joint work. The graduation ceremony for people who graduate this semester was held on June 8th, 2018. Although official graduation ceremony was scheduled to be August, 2018, we held our own ceremony earlier due to other team members’ schedule. Our team members, Jaeseung Lee and Chanho Min received Ph.D degree, and Inyoung Sung received Master’s degree. Our team members, Dohyun Kim and Dohun Kim, had oral tests for Ph.D students in Seoul National University on March 20, 2018. They gave presentations about numerical analysis, probability theory and their current projects, and they successfully passed the exam. The graduation ceremony was held on February 23rd, 2018. Although official graduation ceremony was scheduled to be February 26th, 2018, we held our own ceremony earlier due to other team members’ schedule. Our team member, Dongnam Ko, received Ph.D degree. International conference on Nonlinear Partial Differential Equations and Related Topics will be held February 26-March 2, 2018. Our team member Jaeseung Lee, Jeongho Kim, Jinwook Jung and Dr. Yinglong Zhang will give contributed talks. For more information, connect to TSIMF. I am glad to announce that Dr. Jinyeong Park, one of our former team member, was appointed to a professorship at Hanyang university, Republic of Korea. Please celebrate his appointment and congratulations, Dr. Park!